A Completed Generator Interlock Kit Installation. Dear Mr. Electrician: How can I install a Generator Interlock Kit on my existing GE main circuit breaker panel so that I can connect a portable generator to it safely? Answer: You first must determine if you have the needed spaces for a generator circuit breaker. Then you need to order the correct interlock kit that is approved for your circuit breaker panel. 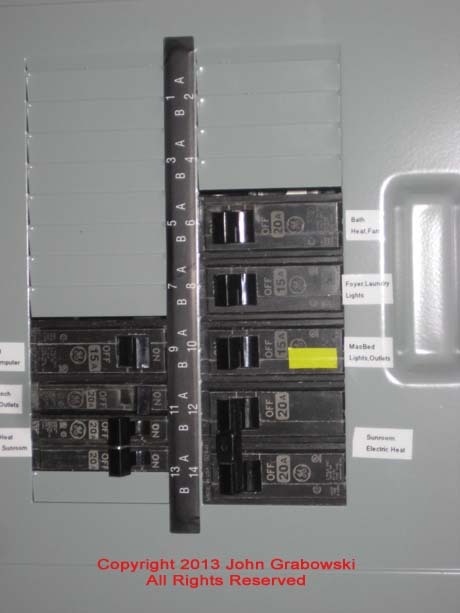 The photos below depict an interlock kit installation onto a GE main circuit breaker panel that was originally installed in the 1980’s. 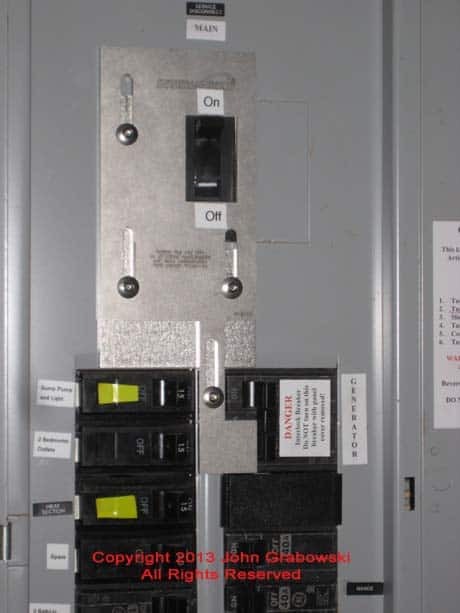 This is the “Before” picture of an existing GE main circuit breaker panel (Also known as a “Load center”) Three circuit breaker spaces in the top right side position are required for an interlock kit for this particular circuit breaker panel. 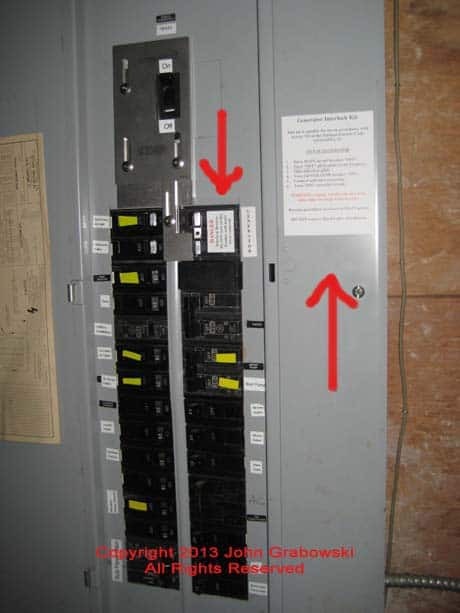 The red arrow indicates on the label for this GE circuit breaker panel that it is approved for a maximum capacity of 30 circuits. It reads “30 Poles Maximum”. Therefore in order to comply with the “National Electrical Code”, some of the existing circuits need to be removed from this panel as it already has more than 30. By removing circuits, room is made for the three spaces needed for the interlock kit and also brings the circuit breaker panel back into code compliance in order to pass inspection. This is what the circuit breaker panel looked like before any changes were made. The orange 10/3 Romex cable hanging down on right side of the circuit breaker panel is the feed from the portable generator inlet box which is mounted on the outside of the house next to the garage. Another “Before” photo depicting the existing two GE circuit breakers on the upper right side that need to be relocated to another part of the main panel or to a new GE sub-panel. This is the existing wall space that was available to install a GE sub-panel. A photo of the inside of the main electrical panel before any changes were made. Because most of the original circuits were not labeled, a circuit tracer was used to identify many of them. Here is the new sub-panel installed using 3/4″ EMT conduit. A 3/4″ EMT bender was used to bend the conduit to fit into place. Pre-bent conduit elbows and offset fittings are available for some sizes of electrical conduit. Note the 4 11/16″ square junction boxes mounted on the ceiling. By mounting the junction boxes there, it made it very easy to remove cables out of the existing GE main circuit breaker panel and bring those circuits into the new GE sub-panel. Another shot of the new GE sub-panel with 3/4″ EMT conduits for the panel feed as well as the branch circuits. The completed GE sub-panel with all circuits labeled as required by the National Electrical Code. The yellow tape on the circuit breaker is there to help the homeowner choose circuits to run off of the portable generator. Close shot of the GE sub-panel with circuits labeled. The completed interlock kit installation with many of the circuits labeled. The red arrows point to labels that were provided by the interlock kit manufacturer and must be installed as per the instructions supplied with the interlock kit. The yellow tape marks are there to help the homeowner choose some of the important circuits to be powered by the generator. When the utility company power goes out, this basement will be dark until the portable generator is powered up. This is the area that the homeowner chose to have the generator inlet box installed. It is next to the garage door. Article 445 in the National Electrical Code covers generators. You should also read article 702 entitled “Optional Standby Systems”. Article 250 is also applicable as are others that may be contingent on the type of wiring methods used. A close shot of the Reliance PB30, 30 amp, 120/240 volt, L14-30 generator inlet box. 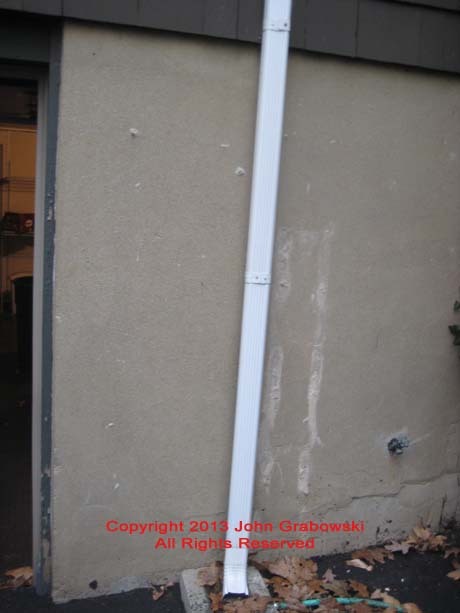 It was caulked using GE Silicone 2 Gutter and Flashing caulk to prevent any water from getting behind. This is the completed interlock kit installation. The main breaker handle gets pushed down to the “Off” position. Then the generator circuit breaker can be pushed “On”. When the utility company restores power, the generator breaker is pushed “Off” and the main breaker handle is free to be pushed up to the “On” position.